We will be very happy to welcome visitors to Jerusalem on פסח – please join us for the Davening. On the days of חול המועד, Shacharis is at 7:50, Mincho is at 6:50 followed by a Shiur (approx. 45 min.) and Ma'ariv. The location is 73 Nof Ramot (Wallenstein). For a map please click on this link. Our detailed timetable (including times of Davening on יום טוב and Shabbos) can be found at this link. On חול המועד in Bnei Brak, there will be a festive event for those affiliated with Ashkenaz shuls. 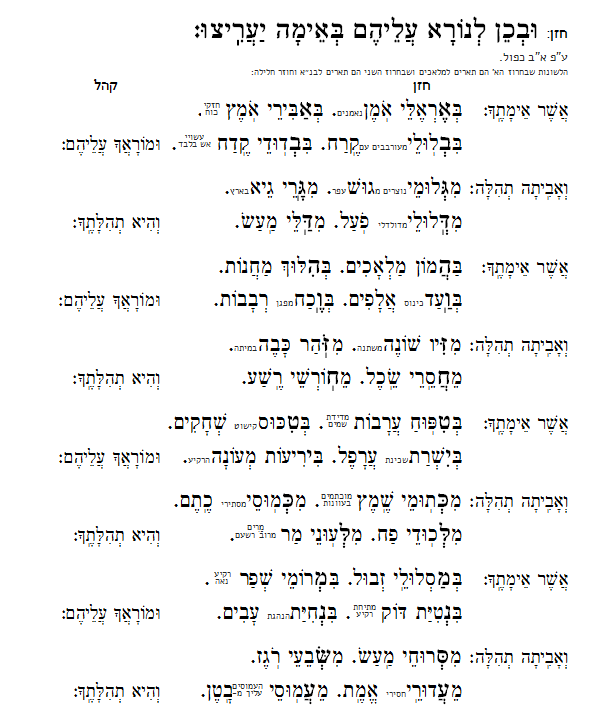 The program includes a drasha by HaRav Binyomin Shlomo Hamburger שליט"א as well as singing of piyutim, zemiros etc. IY'H it will take place Thursday night April 13. Mincha at 6:45 in Beis Knesses Yeshurun (25 Rechov Ben Yaakov, Bnei Brak) followed by a drasha and then Ma'ariv at 7:45. Immediately afterwards, there will be singing of Ashkenaz melodies in the hall next door. 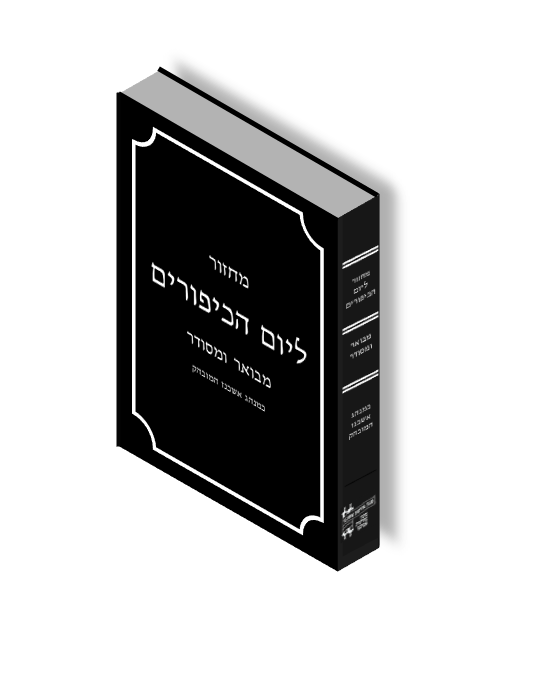 We are very pleased to announce that the new מחזור on יום כיפור is available for sale. The מחזור follows the old Ashkenaz (FFAM) Nusach, (with footnotes throughout the whole מחזור for today's Nusach). The מחזור was edited by Rabbi Avrohom Aumann, a member of our Beitar branch, and was published by Machon Moreshet Ashkenaz. It has הסכמות from Moreinu Rav Gans שליט"א, and from Rav Hamburger שליט"א (head of Machon Moreshet Ashkenaz). It is available for 30 NIS, and for members of Ashkenaz communities, is available for a subsidized price of 10 NIS. See advertisement below and click here for sample pages. Mazal Tov to R' and Mrs. Michoel Kernberg, on the birth of 2 granddaughters and a grandson. Mazal Tov to R' and Mrs. Boruch Heinemann, on the wedding of their daughter, and on the Bar Mitzvoh of their son. Mazal Tov to R' and Mrs. Chayim Ochs on the birth of their grandson. In the English edition of the "Mishpacha" magazine, there is an article about our Nusach project, and about Mr. Benno Weis's work to preserve the nusach. See pages 40-41 of "The Record Keepers" supplement in the Sukkous issue. 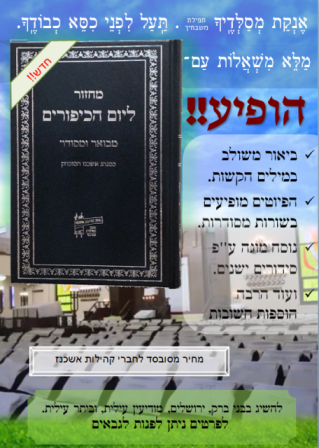 We are happy to inform our newslist, that a new edition of Siddur Tefillas Yeshurun is ready for print, and will be available as a set of two hard copy volumes: "Siddur Tefilas Yeshurun", and "zemiors & Brochos Yeshurun". The Siddur was put together by Rav Hofmeister from Vienna, and is his responsibility as far as the Nusach is concerned. In general, the Nusach in the Siddur is the Nusach of the Ashkenazi Rishounim and early Achrounim, (and is not exactly the nusach used in KAYJ). The set will retail for 36, EUROS/US-Dollars (24, plus 12) or 135, NIS (90, plus 45) (plus packaging and shipment). All pre-orders before or on ראש חודש חשון will receive a special discount price: 30 EUROS/US-Dollars (20, plus 10) or 105 NIS (70, plus 35) (plus packaging and shipment). We will be very happy to welcome visitors to Jerusalem on סוכות – please join us for Davening on יום טוב or חול המועד.Shacharis on חול המועד is at 7:45 am. Mincho is at 6:15 pm, followed by a shiur, and Ma'ariv. On Hoshano Rabbo Shacharis is at 7:40 am. The location is 73 Nof Ramot (Wallenstein). Please call 052-761-1890 for directions, or click here. Mazal tov to R' and Mrs. Meir Erlanger on the birth and the Bris of their grandson, son to R' and Mrs. Dovid Aryeh Shmueli.